Five Senses Tastings and V Wine Room once again join forces with The League of Women Voters of Los Angeles for our annual Women's History Month event. This year's "A Woman's Voice" program is subtitled "The Silence Breakers". We will explore the stories of four brave women who, in their own unique ways, broke silence on issues ranging from voting rights to sexual assault, gender equality and gun violence. 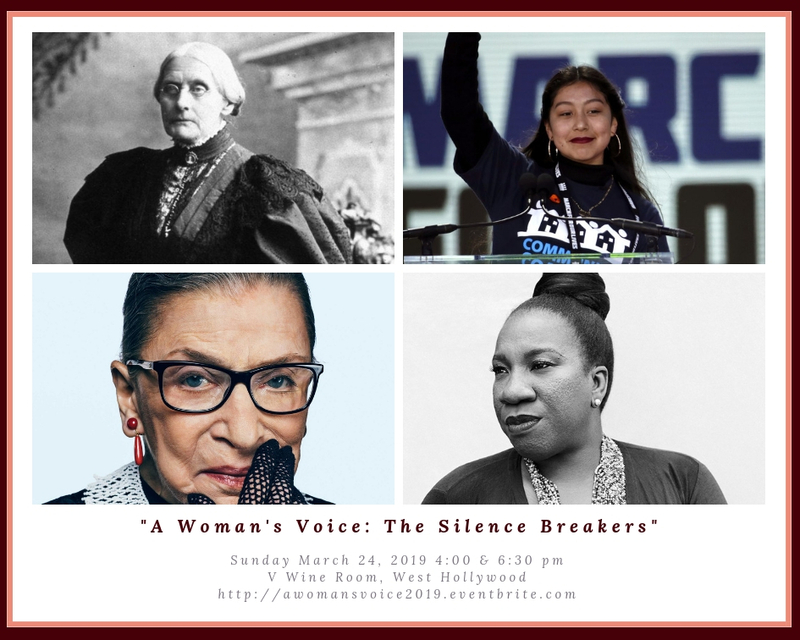 Our featured Silence Breakers are Ruth Bader Ginsburg, Tarana Burke, Edna Chavez, and Susan B. Anthony. Please join us for an exquisite music, wine, and chocolate tasting where we will feel the power of women's voices! Featuring the music of women composers and poets, wines by female winemakers, and chocolates by the wonderful Catherine von Ruden of Eos Chocolates, our guests will engage in a truly full-sensory experience. Sunday, March 24th at 4:30 p.m. is the League event. Additional showing at 6:30 p.m. open to all.